I am taking an early morning flight to San Diego tomorrow morning. We are boarding the ship in less than three days, and I'm so excited! I am currently in New York City after my fun long weekend in New England. We ended up going to Maine and Vermont like I talked about in my last post. I put almost 700 miles on our rental car in just four days. The hot air balloon festival was a lot of fun, as was the tour of the Ben & Jerry's ice cream factory. Anyway, I bought my Japan Rail pass today in NYC. It always helps to be in New York when you need to get something done because all major offices are headquartered here. I just love this city! I went in person to get my pass so I didn't have to spend any extra money on shipping. I don't think I would have been able to get it shipped anyway since I am leaving tomorrow morning. I am so glad to have this done because apparently this pass is something you cannot buy in Japan. Since Japan is the first country on our itinerary, I would have been screwed if I didn't buy it today. The pass is only for tourists, and you can only buy it from your home country. I would not have known that I needed to buy the Japan Rail pass ASAP if it weren't for my chance meeting with a fellow voyager on my flight from New Hampshire to Philly. My life has been full of coicidences lately, that being one of them. Being the eavesdropper I am, I overheard a girl sitting a few seats behind me on the plane talking about leaving for Semester at Sea in a few days. I told her that I was also going on the voyage, and then she decided to come have a seat next to me. We talked about Semester at Sea the entire flight back. This is the first person I have met so far that will be on the ship with me. I don't know a single soul on the ship other than her! Our conversation made me realize how unprepared I am compared to her, which worried me, but then I realized that everyone has a different style of going about things. My style is more of a spur-of-the-moment, spontaneous style. I like to go with the flow. I know if you plan out everything, you're asking for trouble because things don't always go as planned. Like one of my Facebook quotes says, "Life is what happens while you are busy planning something else." I know I will meet some amazing people on the ship who will make great travel buddies and lifelong friends. Get ready, San Diego and my fellow SASers, here I come! Wow, it has been over a month since I've written! I can't believe the countdown to embark on our life-altering voyage is now down to a mere single digit! Boy, does time fly! I said I would be better about writing, but cut me some slack... I have been insanely busy these last few weeks. Let me give you a brief summary of what the past month has been like for me. The last week of July was a little daunting to say the least because I had to pack all my bags for Semester at Sea, put the rest of my stuff in a storage unit, and move out of my place. I was in a time crunch. Then on July 28th, I left for Toronto to attend my aunt and uncle's 25th anniversary party. I was there for ten days and had an amazing time. I hadn't been there for over eight years, so it was good to be able to catch up with my cousins and extended family. We watched a lot of movies and went to Paramount Canada's Wonderland, where I rode every roller coaster in the park. In the midst of all our fun-filled activities, we still found the time to plan and organize everything for the huge extravaganza that was the anniversary. The party itself was on a really nice yacht that cruised around the harbor of Lake Ontario, and I got to dress up in an elegant Indian sari. From Toronto, I flew to Chicago to visit my mom for seven days. Chicago is a really fun, diverse city, and I did a lot of exploring in the short amount of time I was there. In my opinion, the best way to explore a city is to live like a local, use the public transportation to go all over the city, get lost, and find your way back. It's okay to ask for directions. It gives you humility, rather than take away your pride. My mom and I both got the 7-day CTA pass and went all around the city. We took a Yoga class together, went to the art museum, the planetarium, the aquarium, the beach along Lake Shore Drive, and to Devon Ave. (the street known for all its Indian stores and restaurants). From Chicago, I flew to Philadelphia to visit more family, and then just this afternoon we flew into New Hampshire to vacation up in the White Mountains for five days. It feels so nice to get away from the smog and pollution of the big city and be up in the mountains breathing in the fresh, crisp New England air. A family friend of ours owns a summer stock theatre up here called the Weathervane Theatre, so we will be going to some plays, including "Evita" and "The Philadelphia Story". Since we have a rental car, we may take a leisurely drive to Vermont to visit the Ben & Jerry's ice cream factory and perhaps even to Maine for the 15th Annual Great Falls Balloon Festival. Next week will be hectic once again. Monday night, we will be flying back to Philly, and then the next morning, I will be taking a Greyhound bus up to New York City to visit a friend. We will be there for two days and then take off for San Diego on Wednesday morning. There, we will do some sightseeing for two or three days (I really want to go to the San Diego Zoo because I adore animals!) and then embark for my voyage on the 25th. I will be boarding the ship two days prior to the rest of the student body because of my position as a work grant recipient. I still can't believe this trip is really happening... it feels surreal. 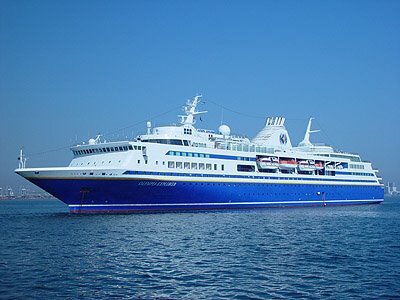 Just eight months ago, I was trying to think of a good topic to write for my admissions essay, and now it's just nine days till we board the mighty MV Explorer! I know I have a semester full of personal growth and discovery ahead of me, and I can't wait to live it to the fullest.